I must admit, I had no idea what to expect from this game. Whereas with Azure Striker GUNVOLT, I knew exactly what I was getting into, I had heard practically nothing about Mighty Gunvolt. This is despite it being by the same studio and arguably the same genre. 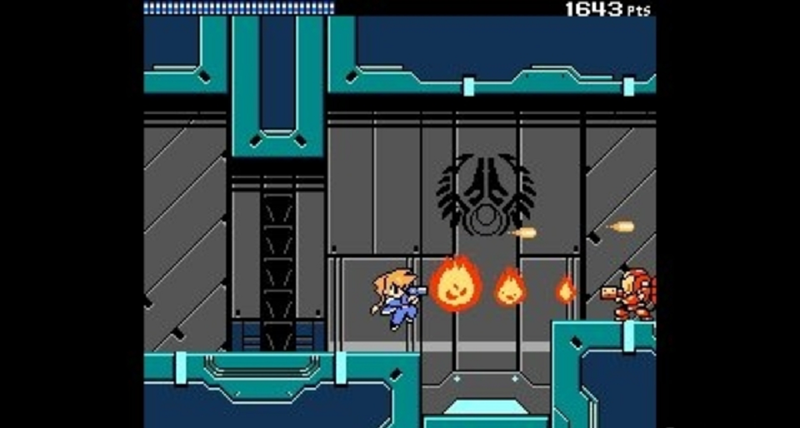 However, the last Nintendo Direct saw the European release of both, along with a deal that if Azure Striker was purchased from the eShop, Mighty Gunvolt would be free, so how does it play? 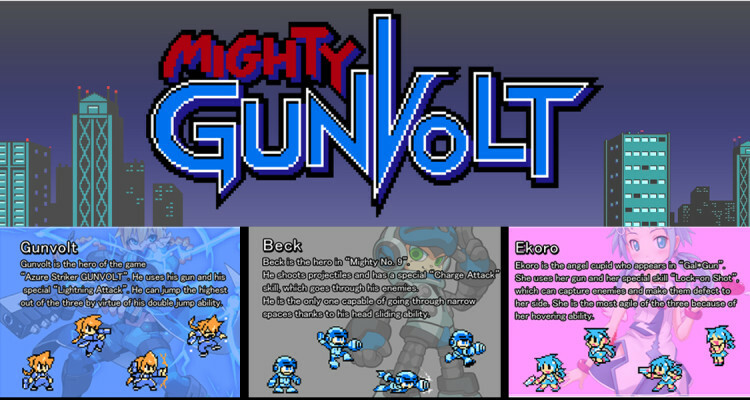 From what I can gather, the story of Mighty Gunvolt is very similar to its counterpart. Both revolve around a character called Gunvolt, and a sinister organisation called the Sumeragi Group. The main difference with this game are the two other playable characters (unless there are unlocks later in Azure Striker that I haven’t reached yet); Ekoro and Beck. Ekoro is an angel from Gal*Guns, another Inti Creates game, and Beck is the hero of Inafune’s Kickstarter project, Mighty No. 9. In fact, in the vein of classical definition of retro titles, the story is essentially some text at the beginning of the game and is not really alluded too from then on. It’s a little touch of authenticity that is definitely welcome, especially when it would have been easy to make a game that is “inspired” by the era (such as Shovel Knight) instead of one that could easily have been part of it. In terms of gameplay, Mighty Gunvolt plays much like its counterpart, albeit a simplified version. It sounds like a negative but it definitely isn’t, in fact the gameplay benefits somewhat from being reined back in. It doesn’t have the same spectacle, as it is missing the absurd screen-filling attacks, but it makes easier to play overall than its flashier counterpart. The game is still divided up into chapters like Azure Striker, but the game progresses in a much more linear fashion with each level coming in a particular order for each character. Speaking of which, Mighty Gunvolt’s different characters all have slightly altered control methods. 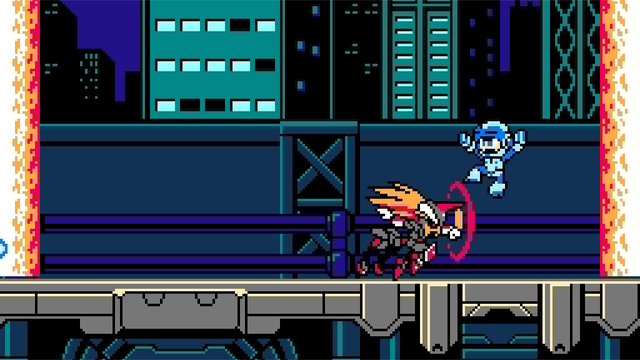 Gunvolt can control electricity, Beck has a slide attack that allows him to move through different areas of the levels that are inaccessible to the other two, and Ekoro has a float jump and the ability to possess enemies. Albeit these differences are marginal, but they are enough to make each character feel fresh. The controls for each character are constantly displayed on the touch screen in a style reminiscent of the instruction manuals of the NES classics. It cannot be denied that Mighty Gunvolt is a purposefully retro affair. The game is beautiful in its homage of the classic games of the past, and all the locations in the game are the same retro interpretations of both realistic and fantastic that is expected from that era (including a wonderfully blocky school level). The music sadly, like Azure Striker, falls short again and is an almost totally forgettable affair. It pleases me in its retro sensibilities, but I have come away from the game not being able to remember a single track that I enjoyed whilst playing. In short, the retro minimal colour palette and chiptune music is perfectly accurate to the era (but quickly forgotten), and brings back wonderful nostalgic feeling. So, should you download Mighty Gunvolt? It primarily depends on whether you like the genre anyway, and then what iteration of that genre you prefer. The short explanation is that Azure Striker is alike the Megaman X/Zero games, and Mighty Gunvolt is closer to the classic Megaman games. So, which one I would recommend depends on which on which of these style of games you prefer. This being said, if you downloaded its counterpart, this is definitely worth a try as a free game.